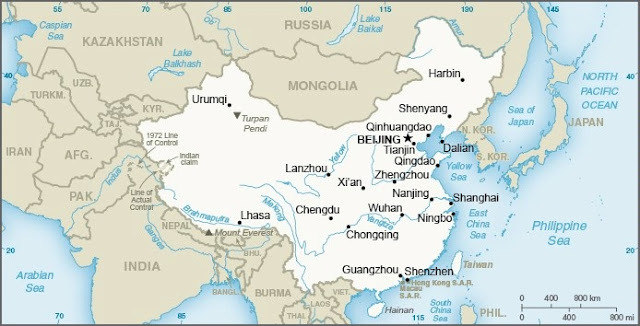 The map of China on the website of the United States Department of State shows Taiwan as being part of Chinese territory. Taiwan (officially Republic of China, ROC) has never been de facto or de jure controlled by the People's Republic of China (PRC). Nevertheless, Beijing insists that Taiwan is part of its territory and it has vowed to use force to achieve "reunification" if all peaceful options were exhausted. China has oftentimes urged the Taiwanese government to adhere to the so-called "1992 consensus", according to which there is only one China in the world and Taiwan is part of it. But Taiwanese President Ts'ai Ing-wen has refused to endorse Beijing's position and is seeking to maintain the status quo of de facto independence. During the Sino-American negotiations that took place in the 1970s, Beijing requested that the United States broke off diplomatic relations with the ROC. In August 1977 Cyrus Vance, Jimmy Carter's Secretary of State, met with Deng Xiaoping and said that the US would retain diplomatic relations with Taiwan. Deng vehemently objected, arguing that the PRC would not establish diplomatic ties with Washington if it maintained government-to-government ties with Taipei (Warren I. Cohen, America's Response to China: A History of Sino-American Relations, 2000, p. 201). On December 15, 1978, the governments of the United States and the PRC released a Joint Communique on the establishment of diplomatic relations. The document stated that the "Government of the United States of America acknowledges the Chinese position that there is but one China and Taiwan is part of China." Washington cut official ties with Taipei but the two sides maintained unofficial relations, the legal basis for which was provided by the the Taiwan Relations Act. The Taiwan page of the US State Department shows only a picture of the island. According to the website, the US "does not support Taiwan independence", but it "insists on the peaceful resolution of cross-Strait differences" and "opposes unilateral changes to the status quo by either side." Earlier this month the Chinese government forced numerous global airlines to list on their websites Taiwan not as a country but as part of China. Yesterday the image of the US Department of State's Taiwan map was circulated on Taiwanese media, which speculated that the US government might have changed the image at Beijing's request. However, there seems to have been no recent modification of the map. The US "acknowledges" but does not "recognize". Hence the careful language of the Communiques.